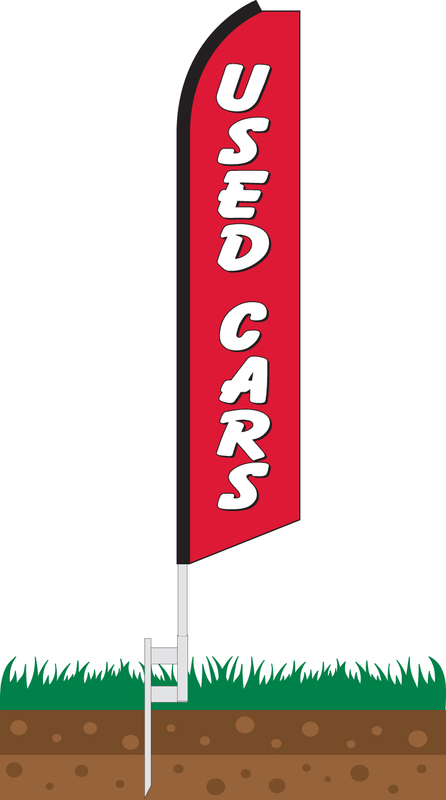 Our Used Cars (Red & White) Swooper Feather Flag features the words "Used Cars" emblazoned upon a striking red background. This flag is ideal for any new or used car dealership looking to draw attention to their lot. The flag can be displayed in an array of different locations including directly in front of the showroom, along the roadside, at trade shows, and much more. 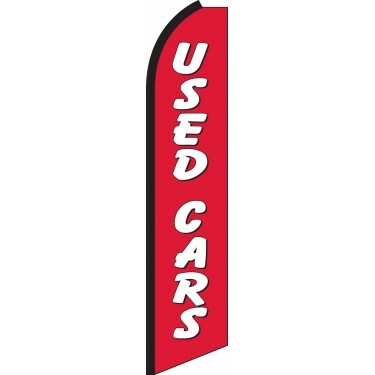 If you want to grab the attention of prospective customers with an eye-catching flag, which succinctly informs them that you provide used cars, this is the perfect flag for you. Our 11.5ft x 2.5ft Swooper Feather Flags are constructed of 110gsm knitted polyester material which is designed to withstand the elements over time. Swooper Flags, which are often referred to as "Half Sleeve Flags," "Bow Flags," "Advertising Banners," or "Super Flags," feature a sleeve which extends half way up the curved portion of the flag. This allows the flag to flutter in the wind with the slightest breeze. Our Swooper Flags are finished with a durable black oxford sleeve and black rope tie at the bottom which keeps your flag looking fresher longer by hiding the dirt. Our unique flags are carefully developed by our graphic designers to feature the most eye-catching and striking designs that will attract maximum attention. Our Deluxe 4-Piece Swooper Feather Flag Pole Sets are constructed of 4 sections of anodized aluminum tubing. Our flagpoles are the same diameter from the top section to the bottom section for maximum durability. Compare this to inferior "telescoping" poles sold by competitors that reduce in thickness from the bottom section to the top. The finished assembled pole stands 15 ft. tall. 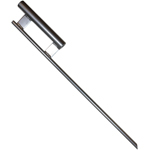 Our ground spikes are constructed from heavy duty industrial grade steel. In order to use this base, it must be hammered into the ground; Then our flagpoles can be inserted into the tube to easily display your feather flag set in the earth. This is our most popular feather flag base. Our Tire Bases are constructed from heavy duty industrial grade steel. In order to use this base, you must place it on the ground so that a vehicle can drive on top of it. Then, you can easily slide your feather flag set into the tube and the weight of the car will support the flag. These bases are an excellent choice for displaying our feather flags in front of your car dealership. 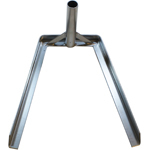 Our X-Stands are constructed from heavy duty industrial grade steel. These bases are an excellent choice for displaying our feather flags on level solid ground including trade show exhibits and display in front of businesses on concrete or black top. 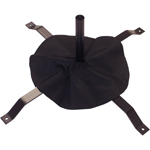 The Sand Bag serves as a weight to stabilize the x-stand and is constructed from durable black polyester fabric and includes a zipper to add/remove sand as well as a velcro attachment system to easily install the sand bag. Sand must be purchased separately at a local hardware store.